Chapter 15 – is for dealing with cross boarder insolvencies. Typically these are ancillary proceedings to a primary proceeding brought in another country. Debtor – is the entity that is obligated to repay certain obligations which have necessitated a bankruptcy filing. 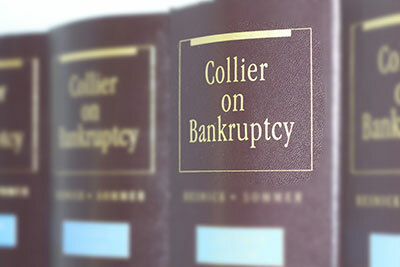 Discharge – is the order entered by the bankruptcy court discharging an individual Debtor from its debts. This order is typically entered after a trustee has fully administered the Debtor's assets, or after the Debtor has fully performed under its Plan of Reorganization. A limited liability company cannot receive a discharge if it is forced to liquidate its assets through a chapter 7 or chapter 11. Insolvent – the bankruptcy code defines insolvent as a "financial condition such that the sum of such entity's debts is greater than all of such entity's property, at far valuation, exclusive of property transferred, concealed, or removed with intent to hinder, delay, or defraud such entity's creditors; and property that may be exempted from property of the [bankruptcy] estate under section 522 of the [bankruptcy code]." 11 U.S.C. § 101 (32)(A). Non-Dischargeable Debts – the bankruptcy code provides that certain debts cannot be discharged through a bankruptcy. The most common non-dischargeable debts are marital support obligations, child support, debts incurred through fraud, claims not listed on schedules or creditors who did not receive adequate notice, student loans, intentional or grossly negligent actions causing injury to others, etc. Plan of Reorganization – a plan of reorganization is proposed in a chapter 9, chapter 11, chapter 12, and chapter 13. Typically the plans provided in a chapter 13 are "fill in the blank" plans. Plans under chapter 9, 11, and 12 are tailored to a specific client needs. The complexity of each plan depends on the complexity of each debtor's particular situation. Secured Creditor – a creditor who has a security interest in property owned by the Debtor. A secured creditor will get paid first from its collateral and if not paid in full will become an unsecured non-priority creditor. Unsecured Non-Priority Creditors – also do not have security for their debts and are paid after the unsecured priority creditors. Secured creditors who were not paid in full from their collateral are included in this category. Unsecured Priority Creditors – these creditors do not have security, but are afforded a higher priority claim against the Debtor because of the nature of the debts. An unsecured creditor is paid after administrative creditors but before unsecured non-priority creditors. These claims are typically wages and taxes. Creditors in this category must be paid in full before unsecured non-priority creditors are paid.